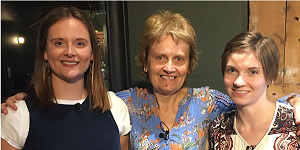 Kathryn Mortimer is a local independent author, and has just published a book - Mother of Millennials - which she co-wrote with her two daughters. One of the core themes of the book is mental illness, which is a subject that is close to her heart. She had written an article about the subject in young adults, and in particular the need to rethink education to give people better informed options. As a mother of a very bright daughter who was forced to drop out of education through mental illness, Kathryn has a deep insight into the stigma involved, and the subsequent challenges of finding meaningful work.